The term "cognitive disorder" implies there is something wrong with the way I think or the way I perceive reality. I perceive reality just fine. Sometimes I perceive more of reality than others. Marcelo Sandoval hears music that nobody else can hear — part of an autism-like condition that no doctor has been able to identify. 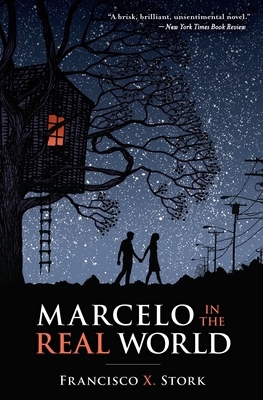 But his father has never fully believed in the music or Marcelo's differences, and he challenges Marcelo to work in the mailroom of his law firm for the summer . . . to join "the real world." There Marcelo meets Jasmine, his beautiful and surprising coworker, and Wendell, the son of another partner in the firm. He learns about competition and jealousy, anger and desire. But it's a picture he finds in a file a picture of a girl with half a face that truly connects him with the real world: its suffering, its injustice, and what he can do to fight.